Chaos at the Kentucky Derby? Bet on It! 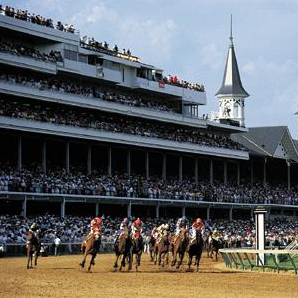 If betting wasn't allowed on horse racing, the Kentucky Derby would likely be a little-known event of interest only to a small group of horse racing enthusiasts. But like the Tour de France, the World Cup, and the Masters Tournament, even those with little or no knowledge of the sport in general seem drawn to the excitement over its premier event—the mint juleps, the hats...and of course, the betting. As most of you probably already know, then, a big part of betting is the odds placed on a particular horse, so that a bet on the favorite to win the race would pay out significantly less than a big underdog. 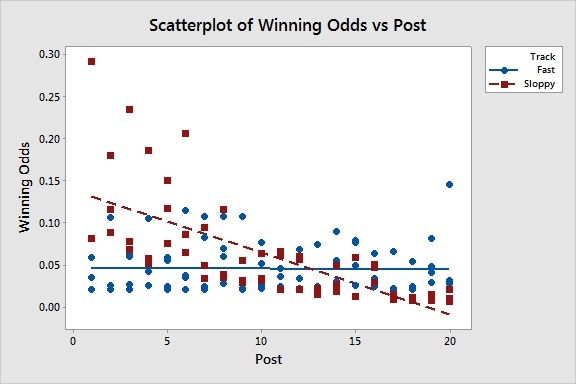 It stands to reason, then, that those horses with the best chances of winning would tend to win more often and those with the worst chances would win less frequently. Odds are typically listed as something like 10/1, which indicates a $1 bet would win $10. Now, this is the opposite of what we typically think of as odds, since a 10/1 horse is actually estimated as having a 1/10 chance (or "odds") of winning. So I'm going to call 10 the "inverse odds" of a horse. 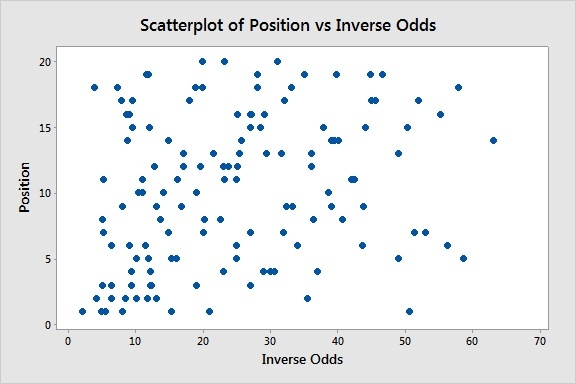 Therefore a low inverse odds horse would be considered a favorite to win (for example, a 2/1 horse has a 50% chance of winning based on betting odds and an inverse odds of 2), while a high inverse odds horse would be considered unlikely to win (for example a 50/1 horse has an estimated 2% chance of winning). 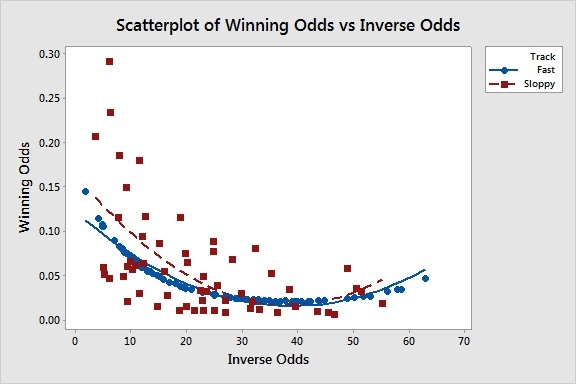 So a simple graph showing the inverse odds of every horse from 2007-2013 against its finishing position should easily confirm that horses with low inverse odds perform better, and horses given high inverse odds perform worse, right? Let's see what a scatterplot made with Minitab Statistical Software reveals. You might convince yourself there is a little bit of a cluster there at the bottom left, but simple regression demonstrates that the relationship, while statistically significant, is extremely weak (R-sq(pred) = 4.69%). I expected to see a much stronger relationship. Instead, these data look pretty chaotic. What we learn here is that when track conditions are fast, a horse's odds of winning are pretty much the same regardless of which post position they start in. But when conditions get sloppy (typically due to race-day rain), there is a very large advantage in having a low post position, toward the inside of the track. 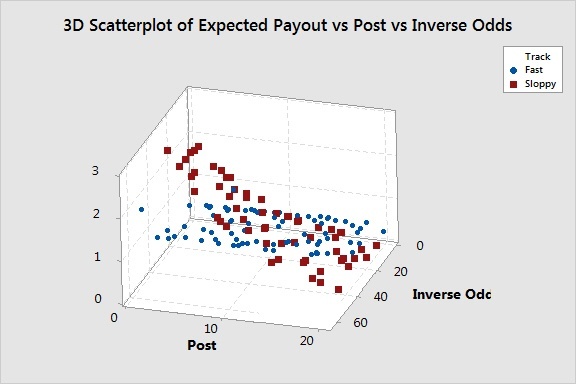 However, there's one thing I mentioned before that has big implications for where one might place a bet...the inverse odds correspond to the payout for picking correctly. So to really learn something, we need to multiple the estimated odds of winning from our model by the payout if we were to win (per dollar bet). A payout of less than $1 indicates that over the long run we would expect to lose money placing that bet. Similarly, values over $1 indicate we would expect to win money in the long run on that bet. In fast track conditions, almost all bets are long-term losers (the "house" takes a cut of every winning bet), but horses with long odds (50/1 or higher) would be expected to gain money. In sloppy conditions, horses in the first few post positions are long-term winners almost regardless of inverse odds, with horses across the range of inverse odds expected to earn roughly the same. The post positions will be listed at http://www.kentuckyderby.com/ once drawn the Wednesday evening before the race. Given what currently looks like sunny weather, I think I'll skip watching the post draw and take my chances with a long-shot like Harrys Holiday, Pablo Del Monte, or Vinceremos!